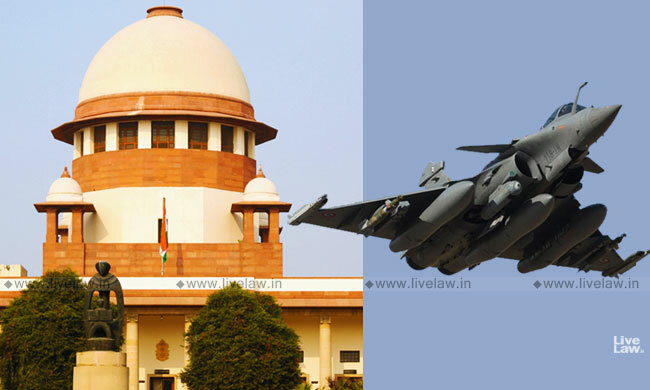 The Supreme Court has allowed open hearing of Rafale review petitions. The bench of CJI Gogoi, Justice S K Kaul and K M Joseph decided today in the chambers to hear the review petitions in open court. Along with the review petitions, the Court will also hear the correction petition filed by the Central Government, and also the petition filed for initiating perjury proceedings against officials who allegedly misled the Court by submitting false information in the notes submitted to the Court. The former cabinet ministers Yashwant Sinha and Arun Shourie along with Advocate Prashant Bhushan in their review petitions have claimed that the December 14 judgment contains "patent factual and legal errors". On December 14 last year, the apex court had dismissed a clutch of Public Interest Litigations, observing that there was "no occasion to doubt" the decision-making process of the Centre in the procurement of 36 Rafale jets from France. The following are some of the main grounds on which the review is sought. The prayer of the petitioners for registration of FIR and investigation by CBI was not dealt with and instead the contract was reviewed prematurely without the benefit of any investigation or inquiry into disputed questions of facts. The government has blatantly misled the Hon'ble Court and the Hon'ble Court has grossly erred in placing reliance on false averments in the note not even supported by an affidavit. The entire judgement is based on disputed questions of facts in respect of which an investigation needs to be done. As the judgement is based on evidently false averments in the note not shared with the petitioners, on that ground alone the entire judgement ought to be not just reviewed but recalled. The judgment did not consider material facts that raise pertinent issues such as: absence of sovereign guarantee by France in the Inter-Government Agreement even though Defence Procurement Procedures prescribed it, objections in Indian Negotiating Team (INT) to increase the benchmark price from 5.2 billion to 8.2 billion euros, and selection of Mr. Ambani's RAL as an offset partner. The Government's note submitted on November 12 stated that the pricing details have been already shared with the CAG, and the CAG report "is examined by the PAC, and a redacted version of the report is placed in the Parliament". Based on this, the Court refrained from examining the pricing details of the deal, on the premise that they have been examined by the CAG and PAC. Since the CAG report was not existing at the time of judgment, the apex court's references to such a report in the judgment led to huge controversy. This led to the Government filing a "correction application" on the next day of judgment, saying that the references to the CAG report were based on misinterpretation of grammatical tenses. Last week, the review petitioners filed another petition seeking perjury proceedings based on the revelations about the Rafale decision making process in the CAG report, and also in the reports published in THe Hindu and The Caravan.